A strong culture of employee well-being can reduce turnover, lower healthcare costs and boost profitability. Get there with the HERO Scorecard in Collaboration with Mercer©, which offers no-cost benchmarking and best practices for companies of any size or industry. How Do Your Wellness Initiatives Compare With Best Practices? 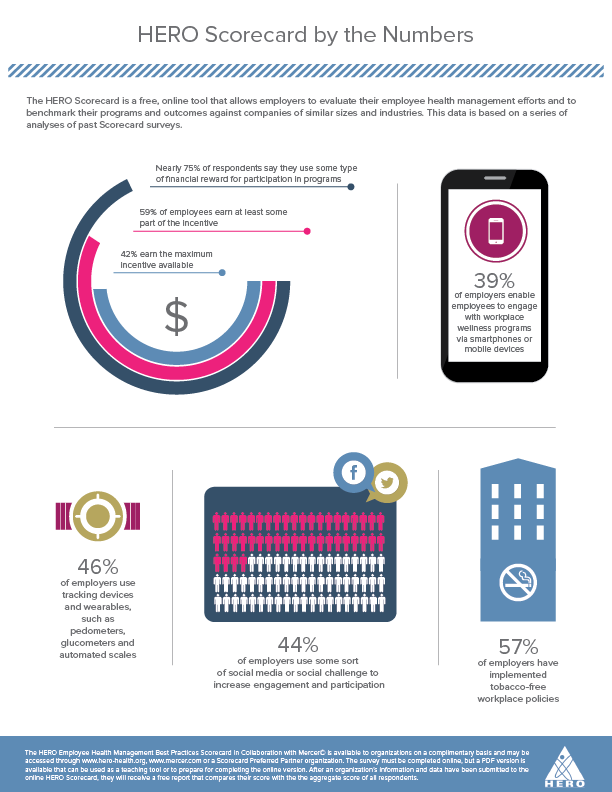 Well-designed, comprehensive and evidence-based workplace health promotion programs can improve employees’ health risk profile and lower their healthcare costs. But not all employers have the tools and knowledge to design and implement world-class employee health and well-being initiatives. Wondering where you stand? Since 2009, the HERO Health and Well-Being Best Practices Scorecard in Collaboration with Mercer© (the “Scorecard”) has helped employers measure how their efforts align with industry best practices. What Is the HERO Scorecard? The Scorecard is a free, online tool that has become one of the most widely used organizational health and well-being assessment tools. More than 2,000 employers have completed the Scorecard in the past 10 years, including companies from services, manufacturing and healthcare industries, as well as many municipalities, universities and not-for-profits. Experts, thought leaders and employers consult the Scorecard to help with benchmarking, strategic planning and evaluating their initiative’s success. The Scorecard can also help predict outcomes important to businesses — health cost trends and employee health risks. What can the Scorecard do for you? See an overview of our findings and imagine how they can inform your planning for workforce health and well-being. Learn how HERO Scorecard-based studies answer practical questions to help you improve programs, including those that support the business case for investments in health and well-being initiatives. This year’s HERO Forum tackled the lively topic of the value of workplace wellness programs. Read our 4 key takeaways. Metrics examine the relationships between outcomes and best practices, as part of a joint project with the Population Health Alliance. 1 Grossmeier et al. “Linking Workplace Health Promotion Best Practices and Organizational Financial Performance: Tracking Market Performance of Companies With Highest Scores on the HERO Scorecard,” Journal of Occupational and Environmental Medicine, Volume 58, Issue 1 (2016), pp. 16–23. 2 HERO Scorecard in Collaboration with Mercer, 2014. Results may vary. Learn more about how the HERO Scorecard, in consultation with Mercer, can advance your organization’s culture of health and well-being.